Every first Saturday of the month at 2:00pm (unless otherwise indicated). Punctuality is strongly requested. Due to other services that usually follow, it is very important that the set schedule is adhered to. Child must be less than 6 years old. 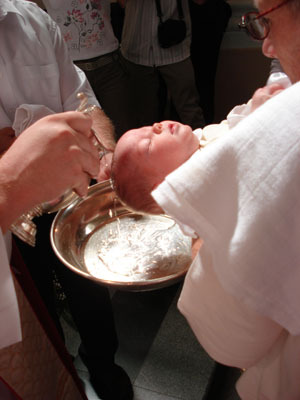 All parents and godparents must attend a pre-baptismal class (held at St. Ferdinand’s every second Saturday of the month from 8:30am to 1:00pm). Interested parties must come into the rectory to pre-register for the class. In addition, couples who wish to participate as sponsors must be married by the Catholic Church and provide a copy of their marriage certificate at the time of registration. If the parents do not live in the area and/or are unable to register their child personally, someone else may come in to register the child. 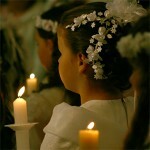 They must bring the documents needed to register along with a letter of authorization signed by the parents, in which they give permission to register their child for the Sacrament of Baptism. No refunds will be issued if there is a cancellation. You may register Monday through Friday in the parish office from 9:00am to 12:30pm and from 2:00pm to 7:30pm. You may also register on Saturday from 9:00am to 12:30pm and from 1:00pm to 3:30pm. 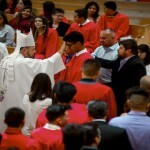 Registered parishioners of Mary Immaculate Church need to obtain a letter from the Pastor giving permission to participate in the Sacrament of Baptism in their desired church. If you complete the pre-baptismal class through this parish you will be issued proof of completion. If you require a permission letter stating you have attended the Pre-baptismal class there is a $5.00 donation (per couple). If you desire to baptize at Mary Immaculate Church and you are not a registered parishioner you are required to bring an authorization from your parish stating you have obtained permission to baptize at Mary Immaculate Church.